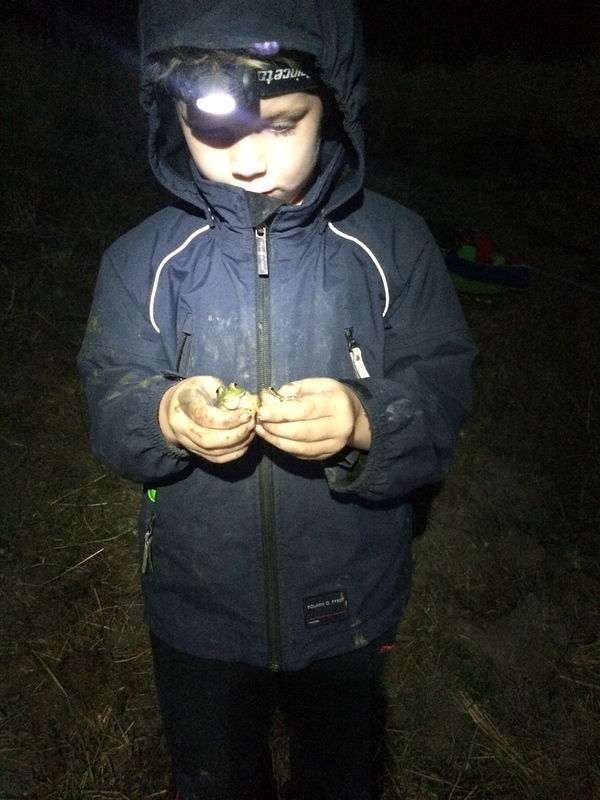 On one of our frequent trips to the Briones bullfrog pond — this was, let me see, Saturday evening — we found a frog we’d never met before, and one that surprised us. 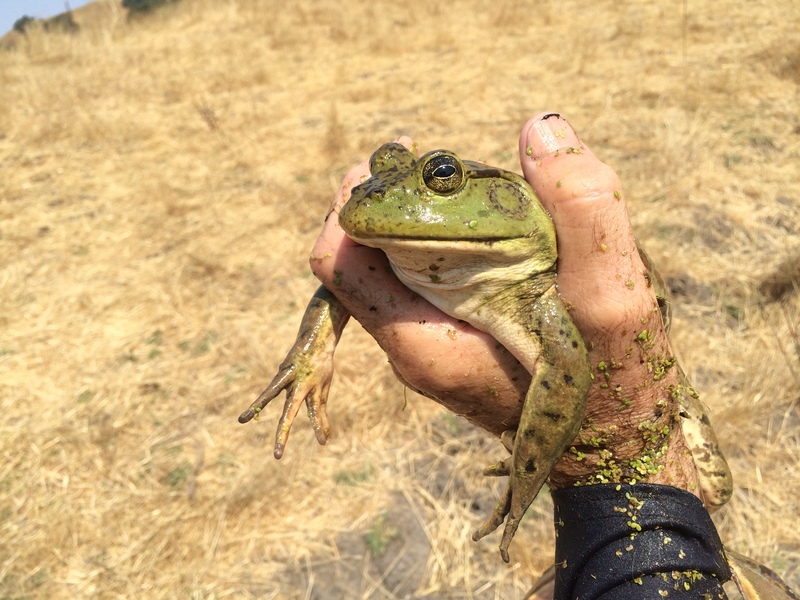 Since the enormous, ravenous American bullfrog (Rana catesbeiana) was introduced to California in 1905, for food — yuck! 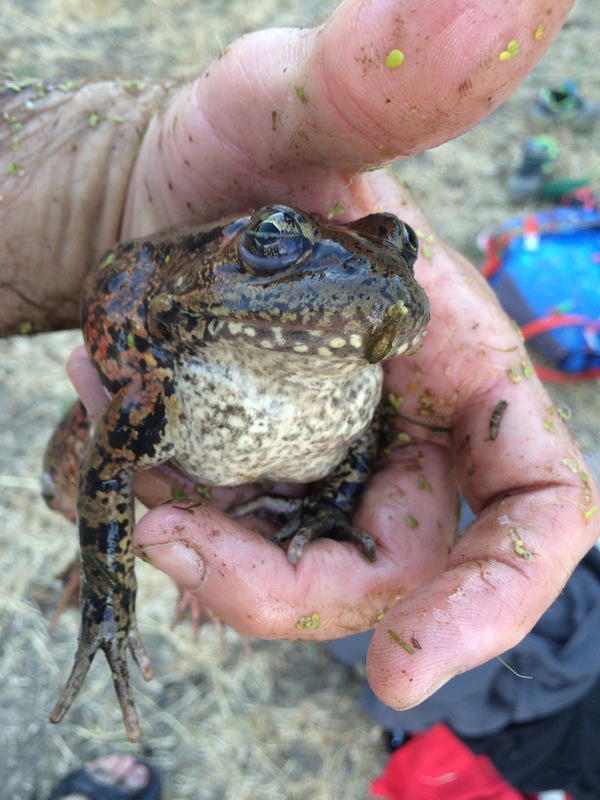 — the native frogs, including this species, Rana draytonii, have been under serious pressure. 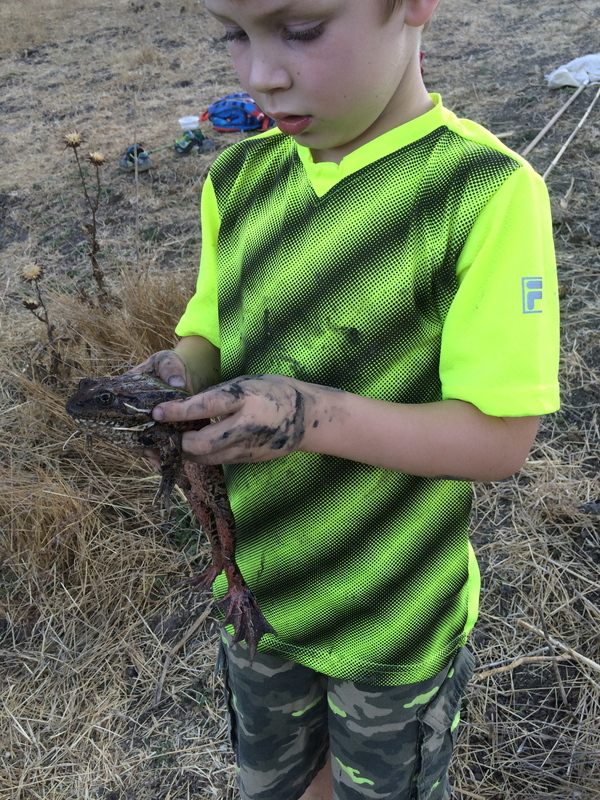 Since this pond we regularly visit is home to several dozen bullfrogs, we didn’t expect to ever find a native California red-legged frog in it, and especially not a very large, healthy one. Yet here it was! 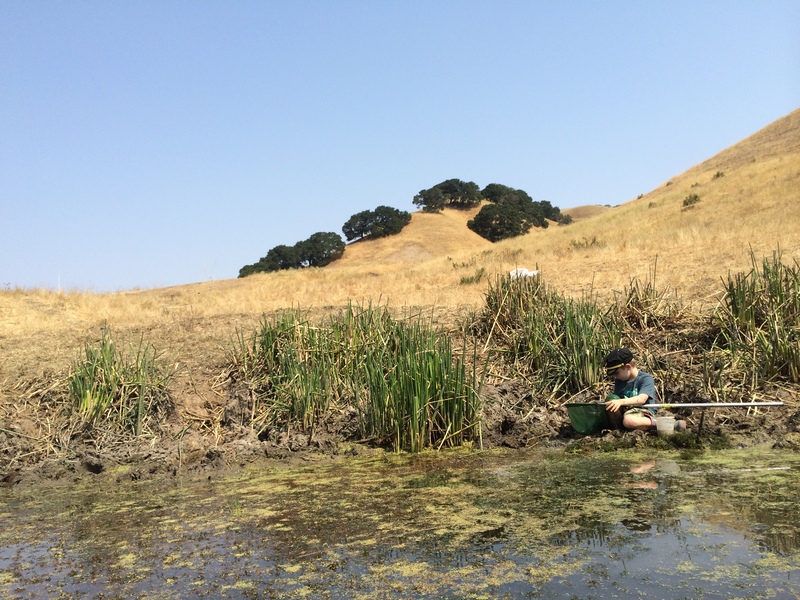 And, even better news — we found plenty of juvenile R. draytonii in and around the margins of the pond, too. 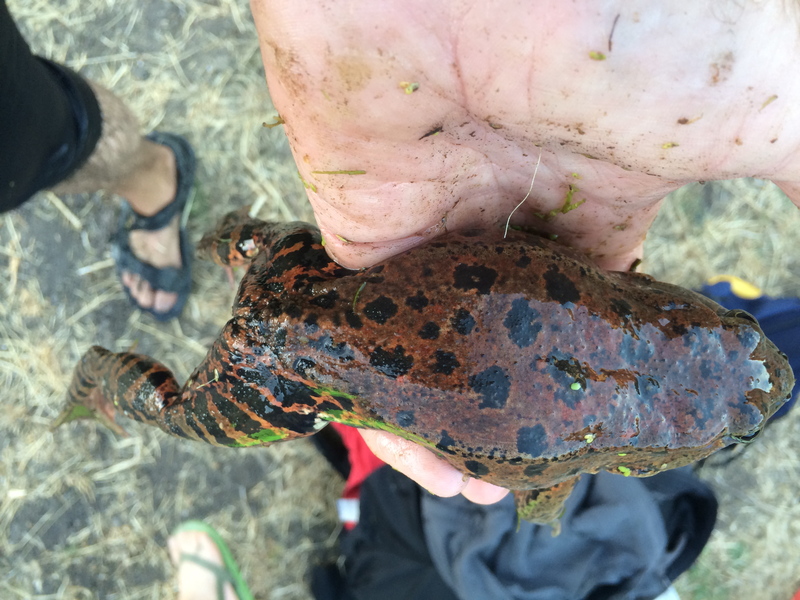 Perhaps the drought is affecting the bullfrogs — they aren’t able to burrow down and survive when a pond dries up completely, which is something the red-legged frog can do. But this pond — though it used to be over my head in the middle and is now just neck deep — ain’t anywhere near drying up yet. And there are still plenty of bullfrogs. 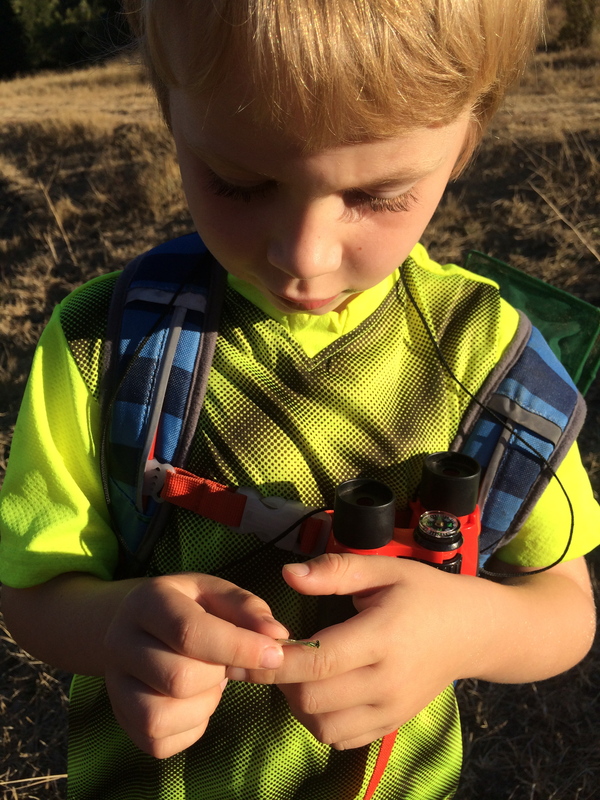 Wait there until dusk and, while enjoying the dance of bats overhead you can be serenaded by the deep bass mating call of a bullfrog! 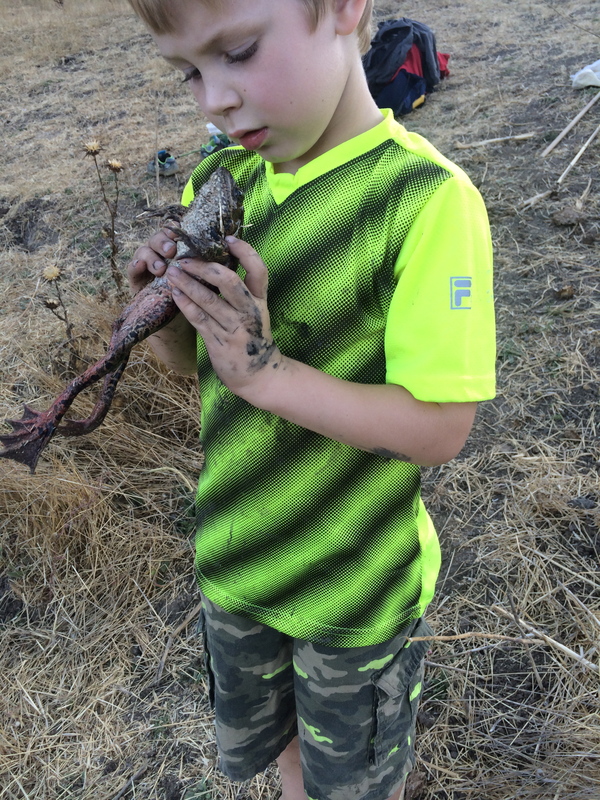 Kieran was thrilled to find a species we’d never encountered before. He examined the new frog carefully, from all sides. The pond, though shrunken, is far from dry (photo taken from the middle, where it’s about five feet deep). We always find dozens of tiny, delicate damselflies. 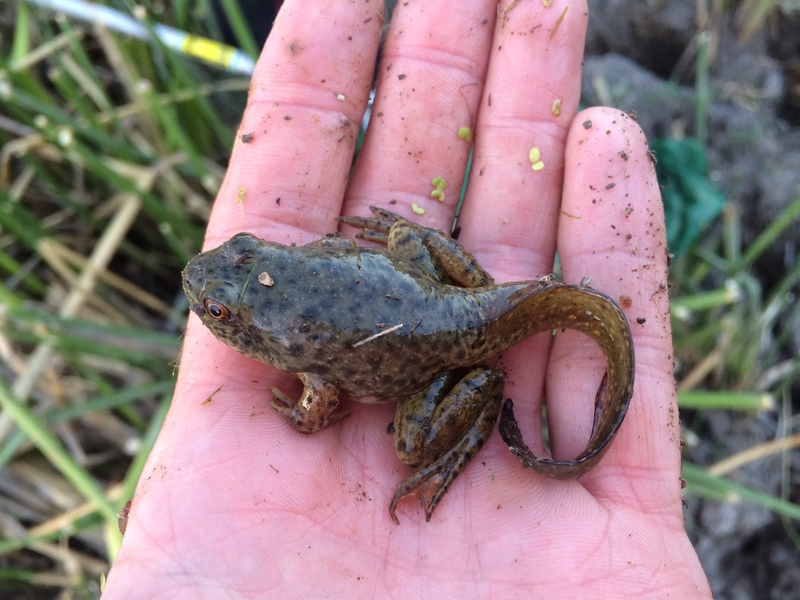 The American bullfrog, Rana catesbeiana, looks quite different. 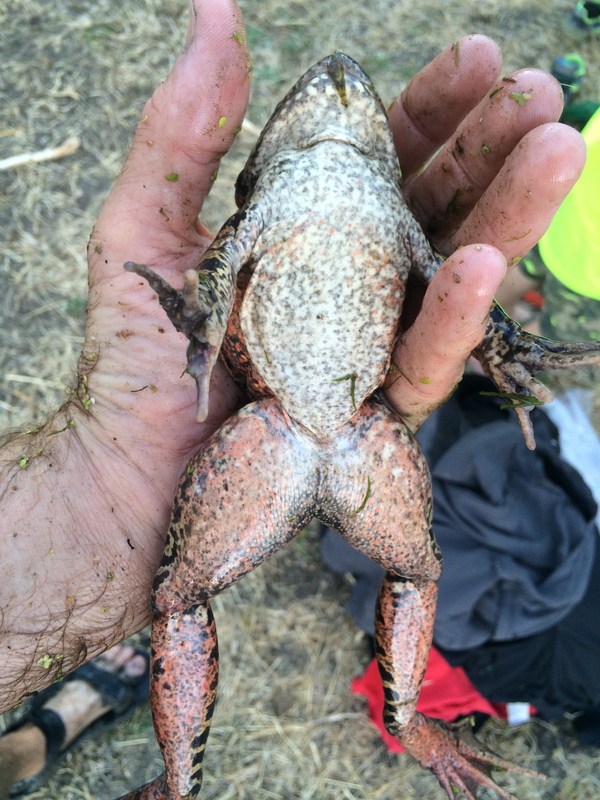 The bullfrog’s belly also looks strikingly different. 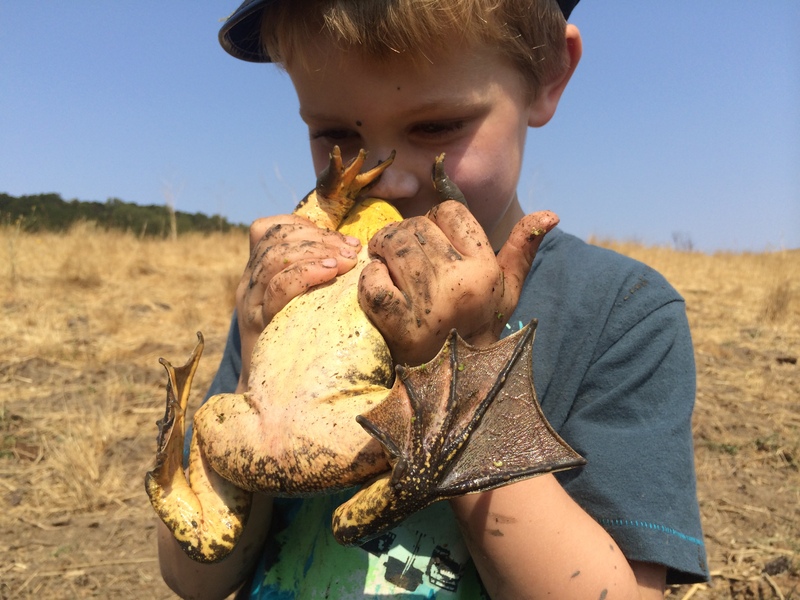 Even when they’re barely adults, bullfrogs are already huge! 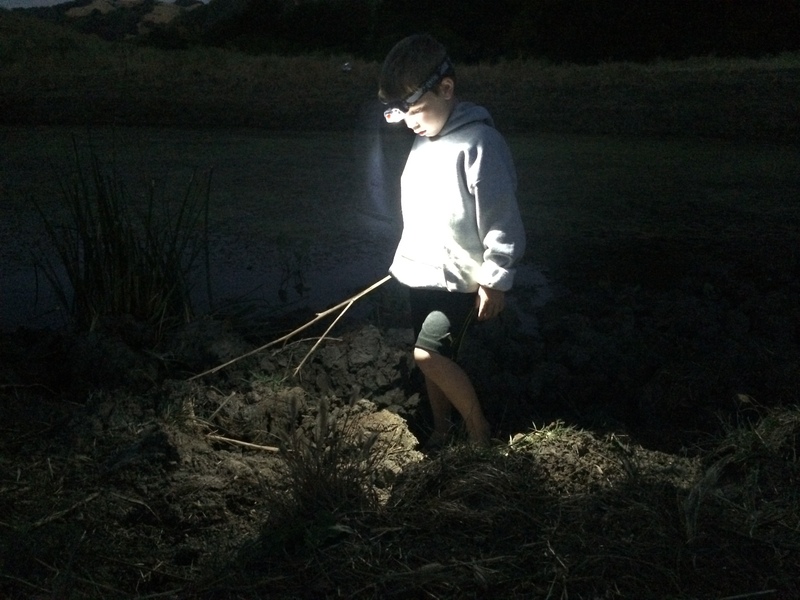 We often stay past dark to hunt for frogs with flashlights. 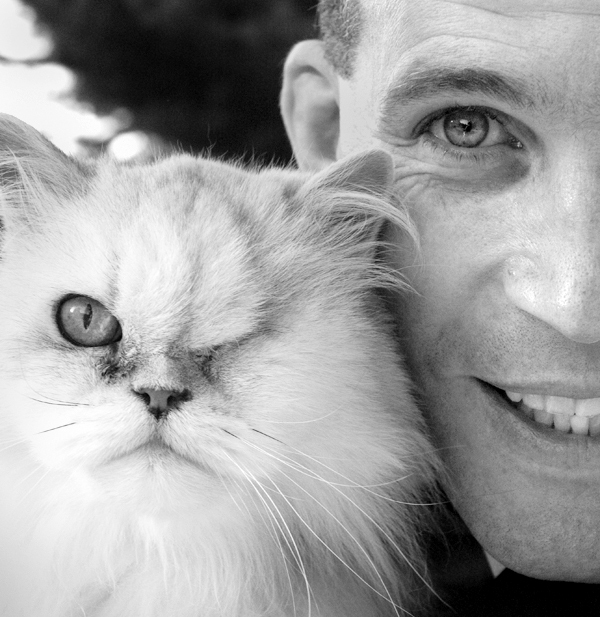 The lights reflect from their eyes and also seem to mesmerize them, which makes it a bit easier to catch them.